The Midnight Review: Hilda Solis Uses Term "Teabagger." Conservatives Cry, Of Course. Hilda Solis Uses Term "Teabagger." Conservatives Cry, Of Course. Conservatives are being hypocritical yet again. Recently, U.S. Secretary of Labor Hilda Solis spoke at a luncheon praising the economic policies of the administration and crticized the tea party movement, calling them "teabaggers." Apparently this was enough for the right wing to cry foul - Big Government propagandist F. Vincent Vernuccio decided to blast the official and unleash a massive amounts of hypocrisy. First, Vernuccio cried about the origins of the usage of the term "teabagger." At the Florida Democratic Party State Convention over the weekend, U.S. Secretary of Labor Hilda Solis insulted members of the Tea Party, referring to the activists as “teabaggers.” Teabagger is a pejorative term used to refer to a certain sexual act. Liberal talk show hosts such as Rachel Maddow brought the phrase into the mainstream in 2009, using it as a tongue-in-cheek insult. Keith Olbermann did a great job reminding the conservative groups who first started using that term. Of course the hypocrisy doesn't stop there. Vernuccio then attacks Solis for admitting a bias towards unions but then criticizes her support because many teabaggers happen to be union members too. The comments coming from the head of the Labor Department are striking because of the recent attacks from heads of unions on the Tea Party—this despite the fact that many union members are also members of the Tea Party. This attack is doubly hypocritical because Big Government has spent a significant amount of time attacking unions - just do a simple search on their website to see the numerous negative articles regarding unions. Vernuccio even differentiates between the two groups later on in his post: "The Tea Party vs. unions and Democrats divide will become even more striking as the 2012 election heats up." So which is it? Are the teabaggers separate from the unions or are they part of the unions? Update - The Midnight Review tried to enlighten the folks at Big Government with the facts but was met with some ignorant resistance. As a service to those idiots over at Big Government, the Midnight Review found this wonderful timeline surrounding the origins of the term "teabagger" from the website The Week. At the first anti-stimulus "New American Tea Party" rally in Washington D.C., a protestor carries a sign reading "Tea Bag the Liberal Dems before they Tea Bag You!!" The Washington Independent's David Weigel calls it "the best sign I saw." Americans for Prosperity, an anti-tax group, is one of the first Tea Party organizations to advocate sending tea bags to elected officials to protest the stimulus package. Several other lobby groups follow suit. 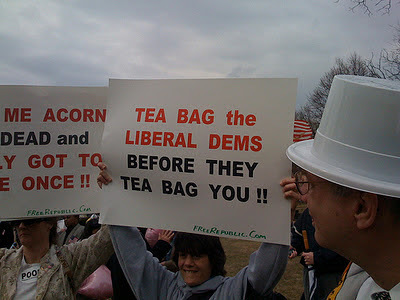 Several Tea Party protest sites encourage readers to "Tea bag the fools in DC." Jay Nordlinger at National Review Online later admits: "Conservatives started [using the term]... but others ran and ran with it." David Shuster, filling in for liberal commentator Keith Olbermann on MSNBC, also makes fun of the phrase. "While the parties are officially toothless, the tea-baggers are full-throated about their goals," he says. Jeff Poor at the Business and Media Insitute says that the MSNBC comments are "lost in juvenile criticism and ignoring the reason there is discontent from the conservative base"
Anderson Cooper, on his avowedly non-partisan CNN show, makes a similar crack , but later back-pedals, calling his remark a "stupid, silly, one-line aside" that was not meant to "disparage legitimate protests." Badges with the message "Proud to be a Tea Bagger" are still on sale at Tea Party events, according to an article written later in the year . A report in The New York Times claims the President called Tea Partiers "the teabag, anti-government people" prompting the blog Redstate to respond : "Sexual innuendo is inappropriate in political discourse. The Left and their media tools need a soap bar sandwich to clean up their act." In an article for National Review Online , Jay Nordlinger notes that the word is being used so regularly, it is beginning to lose its pejorative association. "'Tory' and 'Whig' were put-downs when they originated," he notes, and "'Yankee Doodle' was none too nice." However, he suggests conservatives should continue to oppose the "lowdown term." Prominent conservative Andrew Breitbart posts a video on the site Big Government in an attempt to reclaim the term. "I'm Proud to be a Tea Bagger" currently has over 90,000 views. In his book, Alter quotes Obama saying that GOP opposition to the stimulus package "helped to create the tea-baggers." Grover Norquist, president of the Americans for Tax Reform group, compares it to the pejorative use of the N-word. Let's see if those fools decide to open their eyes. Update - Apparently the people at Big Government would prefer to remain in their shell. After attacking the Midnight Review's comments as being offensive and immature, the users at Big Government then proceeded to direct homosexual slurs towards this website. It is interesting that while Andrew Breitbart (and his website) tried to reclaim the word, they still attack any body else who may use it.